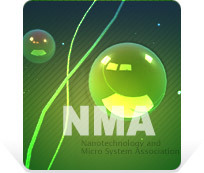 The Nanotechnology and Micro System Association (NMA) in Taiwan was established in 1993 as a non-profit organization which intends to promote international and domestic research activities in industrial and academic institutions, to encourage collaboration and exchange of knowledge among researchers of microsystems and nanotechnology, and to expand the scope of development and the widespread use of advanced Micro Systems and Nano Technologies. The mission of the NMA is to (1) promote the applications and researches related to Micro and Nano technology, (2) collect the world most updated information on the cutting-edge researches and applications of MEMS/NEMS, (3) widespread Micro and Nano-technology information among scientists and engineers both in domestic and international, and (4) enable collaboration and interchange for those who engage, as an individual or organization, in the research and manufacturing of Microsystem and Nano-technology. Promote the applications and researches realated to micro- and nano-technology.. Collect the world most updated information on the cutting-edge researches and applications. Widespread micro- and nano-technology information among scientists and engineers at home and abroad. Foster collaboration and interchange for those who engage, as an individual or organization, in the research and manufacturing of microsystem and nano-technology.